A $100 Guitar Makes A 30,000-Mile Odyssey : The Record The $100 Guitar Project started when two friends bought a cheap guitar on a whim. They invited some other friends to compose and record an original piece on the instrument. Nels Cline, Fred Frith and Elliott Sharp are among the 65 guitarists who recorded for the project that went viral. The $100 guitar proves once again that it's not just the instrument, it's what you do with it. A few months ago, guitarist Nick Didkovsky arrived at a recording studio in Queens, N.Y., with a delivery. It looked like an average electric guitar. But over the past two years, the instrument had been all over the world on a 30,000-mile odyssey that's taken it from Germany to Hawaii, and about a dozen other countries and states in between. 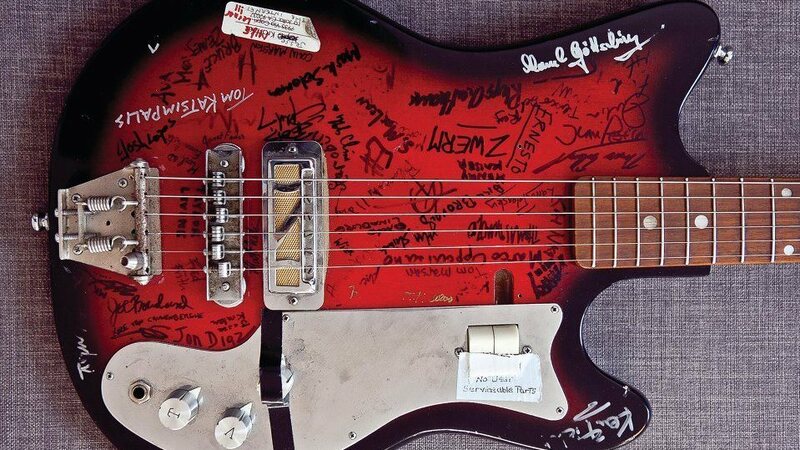 More than 60 guitarists have used it to write and record new pieces, and signed their names somewhere on the body. The list includes some serious heavyweights, like Nels Cline of the band Wilco, prepared guitar pioneer Fred Frith and downtown New York composer Elliott Sharp. "We have people who've made the guitar sound like anything but a guitar, and other people have focused on making it sound like a guitar," says Chuck O'Meara, one of the guitar's co-owners. "The range of sounds people have pulled out of this instrument is really quite surprising." You might say O'Meara is the one who discovered the instrument. He and his friend Nick Didkovsky both play guitar. O'Meara lives in New Haven, Conn., while Didkovsky lives in New York, so they spend a lot of time emailing each other pictures of exotic instruments for sale on the Internet — usually very expensive ones. "One day an email arrives from Chuck, and the subject is entitled very simply: 'The Guitar of Your Dreams,' " remembers Didkovsky. "And there was a little stamp-sized image. A little red, no-name generic guitar. And it cost $100." So they chipped in and bought it together. The $100 guitar doesn't look like much. It's got a solid wood body, an old-fashioned metal pickup and absolutely zero indication of who built it, or when. But Didkovsky says there's something captivating about it. "It looked like a guitar you might dream of if you were, like, 4 years old, or the kind of guitar they would draw in an Archie comic," says Didkovsky. The idea of inviting some friends to record with the $100 guitar came from O'Meara. "Between the two of us, we knew — and know — a lot of other guitar players who would've been up for some silly idea like this," says O'Meara. Didkovsky liked the idea, so they floated it to a small handful of friends. Soon enough, though, the idea began to spread. "We sent out an email to three or four of our friends, and — this is not an exaggeration — within 24 hours, we had 30 people who wanted to record a track with it," says Didkovsky. "And 24 hours or later we had another 25. And we didn't even own the guitar yet." The idea spread by word of mouth through the murky underworld of guitar obsessives. That was October of 2010, and the guitar has been on the road pretty much ever since. This summer, it landed in Colorado, where Janet Feder got her hands on it. Anyone who asked to participate in the project got the same answer: Yes. That applied whether you were famous or not. And Didkovsky says everybody had to work with the same time limit: one week to practice with the guitar, compose a short piece and record it. "Some of the people on the project confessed to me that when they saw who else was on the project," says Didkovsky, "that it raised their bar. It's like, 'My God, I'm on the same record as Nels Cline. I've gotta do something really good.' "
But when Didkovsky handed the guitar off in Queens, Colin Marston (of the bands Krallice and Dysrhythmia) seemed anything but nervous. "I think everybody is in the same boat with this project," says Marston. "We're all kind of like, 'What the hell do I do with this thing?' "
In Marston's case, the answer involved recording multiple layers of feedback and sculpting them into a composition. Marston thinks the instrument's inherent, well, lack of quality might have inspired players to try things they normally wouldn't. "Maybe be more rough with it?" says Marston. "Try some ideas that are less conventional? Like, 'Oh, this is just a piece of junk. I can do whatever on this.' It has a more open feel to it." David Starobin is a classical guitarist and teacher who's worked with some of the most important composers of the 20th century. Most of the time, he plays acoustic classical guitars. But for this project, Starobin made an exception. "What it reminds me of is that TV show on the food channel where they assemble a bunch of chefs," Starobin says. "They have a mystery box of slightly cheesy ingredients, and there's a time factor. There are 65 of us who have each written pieces with this cheap instrument. The flavor ranges from maybe cheesy to palatable. And yet, all of the players have used their creativity, and have come up with, I think, really interesting creations that reflect what each person is about." Starobin was so impressed with that creativity and enthusiasm that he's planning to release a double album of pieces recorded using the guitar on his label, Bridge Records, next month. The owners of the $100 guitar still don't seem sure exactly why their casual project took on a life of its own. But in the end, Didkovsky says, the results say more about the players than they do about the guitar itself. "These people all have very strong personalities," says Didkovsky. "They have strong artistic visions, and they will speak through whatever you hand them. And they spoke through the $100 guitar," proving once again that it's not the instrument; it's what you do with it.